Spider Maestro finds it difficult to distinguish between the spiders in his orchestra. Do you think you can help him out? Here’s where all your subtraction skills can be put to use. 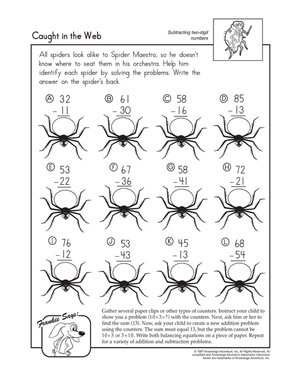 Solve the subtraction problems in the worksheet and write the answers on the backs of the spiders. It will be so much easier to tell the spiders apart when you’re done! “Caught in the Web” gives kids practice solving two-digit subtraction problems.